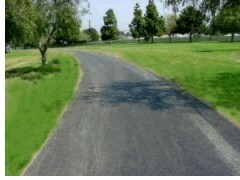 The County completed a recycled rubber demonstration project in April 2001 at the Earvin "Magic" Johnson Recreation Area in South Central Los Angeles. This project used over 1,100 waste tires to make resurfacing improvements to the Senior Citizen Outdoor Shelter, Sam Jones Walking Path, and exercise stations. These improvements eliminated serious flooding problems caused by heavy rain. 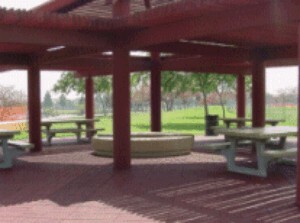 The Outdoor Shelter, located along the walking path, serves as a shaded resting place. Rubberized resilient tiles were installed throughout the shelter and adjacent shuffleboard area. The installation used 300 recycled waste tires and covers 3,000 square feet. The northern portion of the Sam Jones Path, previously a dirt path (right), was paved with rubberized asphalt (far right) made of used tires. The completed path was constructed with more than 500 recycled waste tires and the rubberized asphalt is more durable than conventional asphalt. 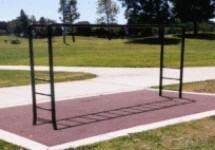 Twelve exercise stations located throughout the recreation area include pull-up bars, sit-up benches, monkey bars, and push up benches which are frequently used by park patrons. The stations' previous surface consisted of wood chips which became compacted over time resulting in flooding and drainage problems during heavy rainstorms. Many residents had expressed concerns that the equipment and stations were unsafe and unusable when flooded. This was resolved when the stations were resurfaced with poured-in-place crumb rubber. The crumb rubber surface covers an approximate area of 1,276 square feet, and provides a level and slip-free surface with excellent fall protection against cuts and bruises. This was resolved when the stations were resurfaced with poured-in-place crumb rubber. The crumb rubber surface for the stations used approximately 330 recycled waste tires in its construction. 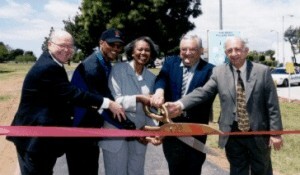 On April 21, 2001, the County held a ceremony to officially open the improvements. In attendance were representatives: Rodney Cooper, Sam Jones, Supervisor Yvonne Brathwaite Burke, Senator David Roberti, and Mike Mohajer. Supervisor Burke delivered the keynote address and cut the ceremonial ribbon. To close the recycling loop, waste tires collected at the November 13, 1999 Waste Tire Amnesty Day were transported to a recycling facility and shredded into crumb rubber. The crumb rubber was then used for a rubber playground mat for Arnold Elementary School in Torrance. 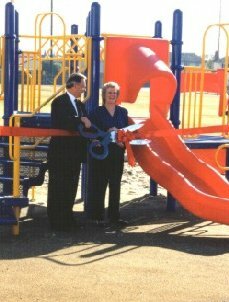 A ribbon-cutting ceremony, attended by the Mayor of Torrance and the School District Superintendent, was held at the school on December 6, 1999. The speakers addressed the student body about the importance to recycle at school and home. The playground mat became a reminder of the benefits of recycled products. After the ceremony, the children tried out their new playground, an activity they had been waiting for since the beginning of the school year. 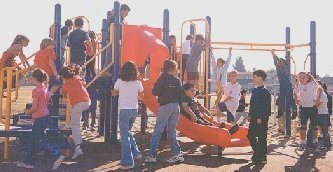 Recycled rubber playground mats were also installed at Wood & Edison Elementary schools that week.